We’d love your help. Let us know what’s wrong with this preview of Hrafnkel's Saga and Other Icelandic Stories by Unknown. They date from the thirteenth century and fall into two distinct groups. Hrafnkel's Saga, Thorstein the Staff-Struck, and Ale Hood are set in the pastoral society of native Iceland, the homely touch and stark realism giving the incidents a strong feeling of immediacy. The remaining four -Hreidar the Fool, Halldor Sorrason, Auduns Story, and Ivars Story- were written without They date from the thirteenth century and fall into two distinct groups. Hrafnkel's Saga, Thorstein the Staff-Struck, and Ale Hood are set in the pastoral society of native Iceland, the homely touch and stark realism giving the incidents a strong feeling of immediacy. To ask other readers questions about Hrafnkel's Saga and Other Icelandic Stories, please sign up. Hrafnkel is the son of one of the first Norwegian settlers of Iceland, and wishes to set himself up as a powerful priest-chieftain in this promised land. As he goes through the stages of ambition and pride, loss and humiliation, and vengeance and return to authority, Hrafnkel gradually changes his perception of power among men. 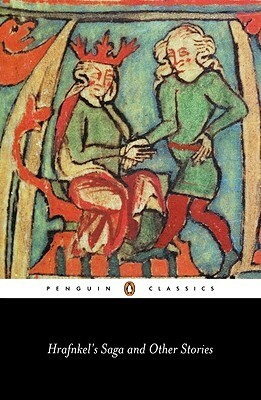 The Icelandic family sagas, the Medieval Scandinavian version of period dramas, include some of the greatest literary masterpieces of European history, among them the lege Hrafnkel is the son of one of the first Norwegian settlers of Iceland, and wishes to set himself up as a powerful priest-chieftain in this promised land. As he goes through the stages of ambition and pride, loss and humiliation, and vengeance and return to authority, Hrafnkel gradually changes his perception of power among men. The Icelandic family sagas, the Medieval Scandinavian version of period dramas, include some of the greatest literary masterpieces of European history, among them the legendary love story of Laxdæla Saga, and the greatest achievement of them all - Njáls saga. Hranfkels saga, I feel, is not a masterpiece on the same level as some of these other hidden gems, but it still is a deeply fascinating story about power, loss and vengeance. This is the book I ought to have started with when I began to dip into Icelandic sagas again recently. The stories are shorter, the plots are tighter with less winding and sidetracking. The cast of characters is usually smaller, so that there are fewer names, patronymics and relationships to keep track of. The characters are sparely but vividly drawn, and even the features of land and sea get some attention when they contribute to the plot. Overall, these tales are easier to digest. Most of the s This is the book I ought to have started with when I began to dip into Icelandic sagas again recently. The stories are shorter, the plots are tighter with less winding and sidetracking. The cast of characters is usually smaller, so that there are fewer names, patronymics and relationships to keep track of. The characters are sparely but vividly drawn, and even the features of land and sea get some attention when they contribute to the plot. Overall, these tales are easier to digest. Most of the same themes I've encountered elsewhere are here too. There is the sense, on the one hand, that good conduct (peacefulness, helpfulness, support of friends and relations) attracts rewards. On the other hand, evil conduct (malicious attitude, excessive violence, vindictiveness, murderousness) attracts punishment. If you're looking for the inspiration for Shadowfax, Gandalf's noble steed, look no further. Freyfaxi the Wonder Pony, noble steed of Hrafnkel is the horse you're looking for. This, and the other stories herein, are marvelous in their own right. But let's face it: it's super fun to see where Tolkien got some of the material for his books. Hrafnkel is a saga writ small, but with all the propelling blunt force of its lengthier cousins. This simple story told in starkly realistic prose draws a vivid picture of tenth-century Iceland’s snow-capped mountains, mires, and grassy slopes dotted with the homesteads of tetchy farmers, who hold honor more dear than life. The story begins with a murder of a poor peasant, who yielded to the temptation to ride his master’s sacrosanct horse. From this grim beginning, the saga branches into a swif Hrafnkel is a saga writ small, but with all the propelling blunt force of its lengthier cousins. This simple story told in starkly realistic prose draws a vivid picture of tenth-century Iceland’s snow-capped mountains, mires, and grassy slopes dotted with the homesteads of tetchy farmers, who hold honor more dear than life. The story begins with a murder of a poor peasant, who yielded to the temptation to ride his master’s sacrosanct horse. From this grim beginning, the saga branches into a swiftly told series of intertwining episodes involving torture, revenge, and complex legal alliances that lead to an unexpected ending. The chieftains and smallholders of medieval Iceland placed great value on esteem, self-reliance and grim humor in the face of provocation. A man who felt he had been offended had recourse to the courts; but because of the legal system’s limitations – there were neither prisons nor police, so the execution of judgement was left to the plaintiffs – proper procedure was often ignored, twisted, or broken outright. Hrafnkel’s Saga is rife with abuses spawned both by man’s pride and by the law’s shortcomings. You won’t turn many pages before you find someone else with an axe in his head. The title story is much more consciously literary than the other stories in this short collection. It's a tale of broken oaths, murder, revenge, legal drama and redemption in medieval Iceland. Several of the other stories have similar themes but have a somewhat different tone, being more like a cross between a short biography of an individual and the anecdotes about him that would get told down the pub on a long winter's night. The latter-most stories take a wider look at the Norse world as they t The title story is much more consciously literary than the other stories in this short collection. It's a tale of broken oaths, murder, revenge, legal drama and redemption in medieval Iceland. The latter-most stories take a wider look at the Norse world as they tell of Icelanders who travel abroad. One character goes so far as Rome, escaping the North altogether for a while. Read this mainly for Hrafnel's saga, but I have to admit that others, which I have never even heard before, were quite interesting, too. Also, great introduction that touches upon the biggest questions and problems about Hrafnel's saga and others in this collection. Hrafnkel's Saga is about a feud and the vicious killings and legal drama that go along with it. There's a Varangian and the lava fields are featured. One of the epithets of King Harald Straight-Hair's ancestor is 'the farter'. The other stories are much shorter and more straightforward. Thorstein Staff-struck was okay. Apparently when they weren't feuding and duelling the Icelanders used to make horses fight each other to relieve men of their pastoral boredom, but then the men would get angry and Hrafnkel's Saga is about a feud and the vicious killings and legal drama that go along with it. There's a Varangian and the lava fields are featured. One of the epithets of King Harald Straight-Hair's ancestor is 'the farter'. Thorstein Staff-struck was okay. Apparently when they weren't feuding and duelling the Icelanders used to make horses fight each other to relieve men of their pastoral boredom, but then the men would get angry and fight the horses and each other and this lead to feuds and duels. I like how Thorstein and buddy kept taking breaks during their duel to the death. Water break, tie my shoes, let's get new weapons. Of course they call it off and settle their dispute. Reminded me Roland taming the giant in one of the chansons de geste. The moral of the story is don't punch horses in the face. Audun's Tale is about a guy who brings a bear from Greenland to the king of Denmark, in order to pay for a pilgrimage to Rome. But he has trouble with the Norwegian king, who wants the bear for himself. I'm assuming it was a polar bear. A good, short introduction to Icelandic sagas. The stories, especially "Thorstein the Staff-Struck," emblematize those things that are so good about the sagas: the collocation of Christian and pagan ideas (and the tension between them), clear-eyed realism and seriousness of tone, and wry humor. I would argue that anyone who grew up in a rural area, in Iceland or elsewhere, will recognize these hard-headed people, and feel at least somewhat welcome in their community. Not only was Hrafnkel’s Saga written in medieval times, it’s also historical fiction. Written in the 13th century, it describes events loosely based upon characters from the 9th century. Scholars have identified the likely author as Abbot Brand Jonson, a 13th century intellectual, church leader, teacher, and mediator. Several of the stories involve the theme of rulers and mediation, both fair and unfair. Half of the stories take place in Iceland, a rough rural country ruled by feudal lords. A fe Not only was Hrafnkel’s Saga written in medieval times, it’s also historical fiction. Written in the 13th century, it describes events loosely based upon characters from the 9th century. Scholars have identified the likely author as Abbot Brand Jonson, a 13th century intellectual, church leader, teacher, and mediator. Several of the stories involve the theme of rulers and mediation, both fair and unfair. Half of the stories take place in Iceland, a rough rural country ruled by feudal lords. A few shorter stories take place in the courts of 9th century Norway and Denmark, where kings Harald Hardradi and Svein Ulfsson rule respectively. These latter stories are fictionalized to the point where scholars have determined that the author had no first-hand experience in royal court surrounds. Yet this makes these stories all the more charming and personal. The stories are part action drama, part clan psychology, and part cautionary tale. Life was tough in medieval days! Pride and power are frequent themes, and the craftiest person, rather than the most “moral” often wins these Icelandic power struggles. Killing someone can be the best long-term solution to problems, and missing such opportunities can be fatal. The court stories, by contrast, show more refined sensibilities, where kings don’t punish small and not-so-small transgressions, which is no doubt not historically accurate. Nonetheless, these stories have more familiar themes, such as the king who helps the fool and who tries to keep peace in his land by showing compassion to his subjects. My favorite is “Audun’s Story,” a court story. Auden, a poor laborer, through helpful actions and diplomacy manages to befriend two feuding kings and make a pilgrimage to Rome (Christianity being all the new rage). He experience cycles of poverty and wealth with a even-minded outlook—while all the time providing for his aged mother at home in Iceland. My favorite rural story is “Thorstein the Staff-Struck,” which although it has its share of violence also depicts good governance, fair fighting, and compassion for others rewarded. Weirdly enough, I was just discussing Norse sagas with someone when this turned up in my book collection. I have no memory of obtaining it, but there it was. These are short prose translations of medieval manuscripts, ranging from very short stories to the longer title piece. They unveil a few of the things we understand [or often misunderstand] about the Viking period, and the world of Iceland. In one case, the character is Icelandic, but the action takes place in Europe. Characters in this world Weirdly enough, I was just discussing Norse sagas with someone when this turned up in my book collection. I have no memory of obtaining it, but there it was. Characters in this world don't always get what we think of as "justice," and their idea of a court of law isn't ours, but several of the stories are centered around legal cases. The great medieval Scandinavian Sagas continue to shock and beguile. Such stunning naturalism, such depth of character psychology, such broad humanism!-- they are, in my view, the best kept secret in Weltliteratur. Has some cool joints. Everyone’s killy, dark, completely homicidally into horses. Plus “Hrafnkel” is almost identical to my crudely elided work email! The title story is one of the densest, richest short stories you are likely to encounter. Typical saga understated brilliance. Okay, I'm a bit biased here. I LOVE Icelandic sagas. My first was Njal's Saga. This was followed by many others. There are different types of these sagas. Most people are probably more familiar with the legendary ones: stories of heroes, monsters and gods. The most popular of this type is the story of Sigurd(Siegried) and the dragon. But there is another type: the family sagas. These are much more real to life stories, and much more prosaic. They take place during or just after the Vikings settle Okay, I'm a bit biased here. I LOVE Icelandic sagas. My first was Njal's Saga. This was followed by many others. There are different types of these sagas. Most people are probably more familiar with the legendary ones: stories of heroes, monsters and gods. The most popular of this type is the story of Sigurd(Siegried) and the dragon. But there is another type: the family sagas. These are much more real to life stories, and much more prosaic. They take place during or just after the Vikings settled in Iceland, but they were written a few hundred years later. Here you will find stories concerning various families and what life was like on a farmstead in Iceland during a time that was hard and gritty. there are here some great grim stories of murder, betrayal, revenge, sorcery and the notorious blood feud. But there is also much kindness and humor: kinship, friendship, generosity, ribaldry. It is amazing that even though this is a different world that we may not relate to, we can't help but feel for the characters and situations. This is mainly because no matter what time and place, humans undergo suffering, no matter how undeserved it may seem. Hrafnkel's Saga, the first of the stories, tells how a powerful and rich farmer is cut down to size because of a murder he committed. But just when you think he is beaten, his fortunes are reversed for the better, thanks to some hard work combined with a little humility. An interesting little collection of sagas and stories from the old Icelandic peoples. I'm glad I read this as a primer to Njal's Saga. There are hints of pagan spiritualism in Hrafnkel's story, but it is not romanticized. The author definitely threw in a few Christian ethical spins (or maybe they would have accumulated naturally through the passing of these tales through medieval Iceland). There are great moments of sacrifice, honour, and a subtle sense of humour in some of these stories. It's a An interesting little collection of sagas and stories from the old Icelandic peoples. I'm glad I read this as a primer to Njal's Saga. There are hints of pagan spiritualism in Hrafnkel's story, but it is not romanticized. The author definitely threw in a few Christian ethical spins (or maybe they would have accumulated naturally through the passing of these tales through medieval Iceland). There are great moments of sacrifice, honour, and a subtle sense of humour in some of these stories. It's a quick read, so if you have a few hours, give it a go. I particularly liked little moments of description and lineage in Hrafnkel's saga and some of the other longer ones. It conjures a lot of "Viking" imagery and history. Hrafnkel's Saga (pronounced roughly like "Hrapket's Saga") is a very rare work indeed, focusing on the average Old Icelandic farmer rather than the heroes, kings, and poets of the day. It's pretty good to boot. The eponymous hero even strings up a group of men through holes he pokes between their achilles tendons and heel bones. The Other Icelandic Stories are the real gems, though. They range from cutesy to tragic and are just good fun reads, some of them almost mini-sagas. I would suggest this b Hrafnkel's Saga (pronounced roughly like "Hrapket's Saga") is a very rare work indeed, focusing on the average Old Icelandic farmer rather than the heroes, kings, and poets of the day. It's pretty good to boot. The eponymous hero even strings up a group of men through holes he pokes between their achilles tendons and heel bones. Great snapshot in medieval Icelandic culture (presumably common enough through Scandinavia that the characters freely travel through it without incident). I found it amusing, though, that a "saga" in Icelandic lore is a lawsuit. Many lawsuits, in fact. The authors of the tales are unknown, but I bet it was John Grisham. I really enjoyed this short book. The stories in it are interesting without having any sort of pretense or grandeur. They're not cautionary tales, or epics involving heroic acts, but much more mundane. They are stories of people, albeit odd people, and stories of Iceland. A great window into the laws of the time and the attitude of he people. An interesting work on the tales of Iceland. It helps if you know who a few historical characters are, especially Harold the Ruthless and his war with Denmark. He comes up frequently. Now, if you’re looking for dragons and elves, this is not the place. These stories read a lot more like the Wild West. I really enjoyed this- some of it made me laugh out loud at times. A good introduction helped contextualise things and footnotes helped give more detail, but didn't take away from the fast- paced narrative. An absolutely great collection of stories. Sure some of them can be dull at times, but I excuse this as the stories were written in a different era and culture. I highly recommend this to anyone with interest in Medieval or old literature. It's like the Godfather, except with families of Vikings. Having never read any sagas before this one, I have to say I was quite pleasantly surprised. A lot more politics involved than you'd expect. Nice collection of short stories, all of them with a morality component. Unfortunately, the style of the Nordic sagas makes these brief narratives less enjoyable in my opinion as the bulk of the tale revolves around heritage and ancestry. Worth the time if you enjoy this style of writing though.